Mel Duncan recently sat down with Dan Perkins (aka Tom Tomorrow) for the Examiner to talk about his new-found Backspacer fame. Is it good to have important friends or important to have good friends? In Dan Perkins' case, both. Perkins (aka Tom Tomorrow, his pseudonym) lost a good chunk of his income when Village Voice Media, home to a dozen papers that published his weekly political comic strip, "This Modern World," decided to stop running all syndicated cartoons. Instead of wielding a sword, Perkins chose a pen by calling friends living in the cities with weekly alt papers affected by the cutbacks. 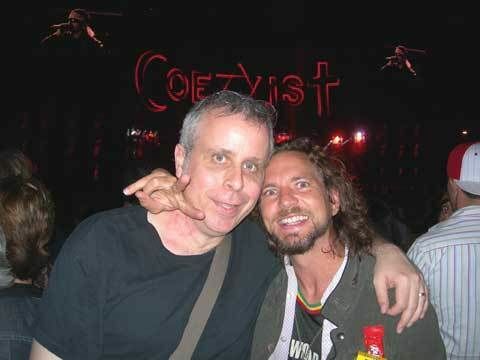 Of of the cities was Seattle, and one of those friends was Pearl Jam's Eddie Vedder. Now, in a year that Perkins no doubt figured would be the usual: writing comics, working on a book, maybe upsetting a few conservatives along the way, this relatively obscure political satirist finds himself not only commenting on the news, but becoming news himself. Between drawing the cover and liner notes for Pearl Jam's ninth studio album Backspacer, a subsequent Spin Magazine cover, and a brand new children's book (his first foray into the genre), Perkins talks with Examiner about the trials and rewards of being an indie cartoonist, his ultimate Pearl Jam mixtape, and unexpectedly finding his art in places he'd never imagine.